You: you’re brilliant, you know? You’re totally a pirate queen or a god-emperor or – at the very least – some kind of superhero. It might not be obvious to everyone else, but you know it. Or, you don’t know it yet, but you’re keen to move in that general direction. No. This is about sovereignty – the state of being absolutely comfortable in your own skin and your own space, able to assert sane and healthy boundaries, in touch with qualities of joy and light and love. Yeah, it’s kind of hippie. That’s cool too. Oops. Getting ahead of myself. I’m talking about sovereignty you can wear. I’m talking about crowns. And capes. With words and symbols embroidered on them to make them uniquely meaningful to you. Are you the sort who’d get a kick out of wearing an actual honest-to-goodness cape or a sparkly crown? Or do you prefer the idea of going incognito, in a secret crown or a secret cape? Clearly, circumstances vary. You probably won’t be wearing a golden crown to a job interview (unless it’s a phone interview, in which case, please write and tell me how it went). And you might decide against turning up to a first date wearing a big, swirly cape, no matter how magnificent it makes you feel. To the uninitiated, however (the bank official who’s discussing your overdraft, say), your secret crown resembles a perfectly innocent headscarf, your secret cape is easily mistaken for a wrap. And you can wear one or other of them pretty much anywhere. Here’s my secret crown. 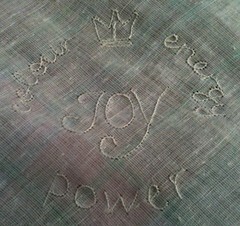 The emblem, embroidered on the under-layer, features a crown and the four words that surged to mind when I asked myself what creativity brings me. Well, the question is, what do you need? What qualities do you want to amplify in your life? What words or symbols resonate with you? What if you could wrap yourself in those concepts, and stride forth into the big bad world with all their interlacing meanings surrounding you? 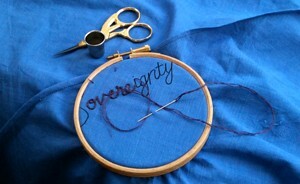 One person simply chose “Sovereignty”. Another chose “Faith, Hope, Love”. A third chose an image of a leaf and some stars. A fourth chose “Nourish, Presence, Enough”. Well, now. Does that cover it? When you say “high-quality, sustainable materials”…? 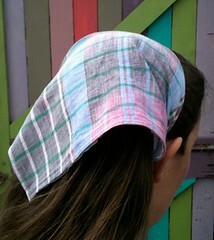 Secret crowns and capes are made from fair-trade organic cotton. I have two suppliers in the UK, who in turn source their fabric from India. It’s hand-woven and hand-dyed, and it stitches up like a dream. For the embroidery, I currently use standard cotton floss, but I’m on the lookout for a more eco-friendly option. Note: the golden crowns will not be made from fair-trade organic anything. They will be made from shiny synthetic goldy fabric I have in my stash. Until it’s all gone, at which point I’ll rethink. When do I choose colours, fabrics, etc.? After I receive your order, I’ll contact you with questions about fabric, sizing, and embellishment. At that point you’ll be able to choose your fabrics, give me the relevant measurements, and let me know what you’d like embroidered on your piece. I’ll be delighted to advise you on any of these decisions. Absolutely. Pay me a minimum of $50 to start with, and tell me (a) what you’re buying, and (b) how many instalments it’ll take you. No problem! Contact me, tell me what you’d like, and I’ll quote you a price.